Warren Gatland voiced his relief after Australia's Kurtley Beale missed a penalty with the final kick of the game as the British and Irish Lions opened the Test series with victory in Brisbane. Full-back Beale slipped during his run up and the ball fell short, enabling the tourists to finish 23-21 winners in a nerve-jangling contest at Suncorp Stadium. As Wales coach, Gatland - who revealed Tommy Bowe and Manu Tuilagi will be fit for the second Test in Melbourne next Saturday - has seen his side concede last-gasp defeats to the Wallabies and he feared a similar outcome today. "My first reaction was 'this isn't going to happen again'. It's happened before in the last couple of minutes - but they only kick those goals against Wales. Then my reaction was relief," he said. George North's stunning 26th-minute solo try helped the Lions to a gripping triumph and Gatland insisted the tourists were worthy winners at a ground perceived to be a Wallaby stronghold. "We tried to play a bit of rugby, probably too much in the first half. We knew it was going to be tight, there's not a lot of difference between the two sides," he said. "Like a sparring match the teams were finding out a bit about each other in the first Test. Both teams will get better after that hit out. It wasn't the prettiest performance, but it was the victory we deserved." Gatland was unimpressed by the performance of referee Chris Pollock, who awarded Australia two late penalties, both of which were missed by the otherwise outstanding Beale. "There were a few decisions that didn't go our way, but we'll take that on the chin," Gatland said. "It was tough at the breakdown. He's penalised Mako Vunipola for coming in at the side when he's made the tackle. "He spoke to Brian O'Driscoll early in the match after penalising him when he was clearly on his feet. Brian said to me he was afraid to compete at the breakdown after that because he was afraid of there being a yellow card situation. "We created some stuff but the referee said advantage over when we were in goalkicking range. There were a few chances we missed out on. It's a huge step up for referees to come in from provincial to Test rugby in terms of intensity." North, who passed a fitness test on a hamstring injury on Wednesday, ensured his name will forever be associated with the Lions after scoring one of the great tries in the tourists' history. Gathering a poor kick from Berrick Barnes, the 21-year-old Wales wing set off on a 60-metre run that swept him past Pat McCabe, O'Connor, Barnes and Genia and into the left corner. On full display was his devastating mix of power and elusive footwork and the try scored on what has been billed as the biggest Test match of the year will rocket him to rugby stardom. He was also denied a second try by the TMO. Another star was born in the Wallabies' two-try wing Israel Folau, a former rugby league international who was playing Australian rules football 12 months ago. "George North still thinks he scored that try that was ruled. He said he clearly had it down. 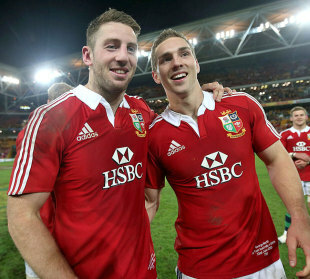 We had two quality wingers up against each other out there," Gatland said. "The guy who does a bit of speed work with us - a guy called Frans Bosch - said to me a couple of years ago that he had worked with two people who he thinks are incredibly special athletes - Israel Folau and George North. They're exceptional talents."